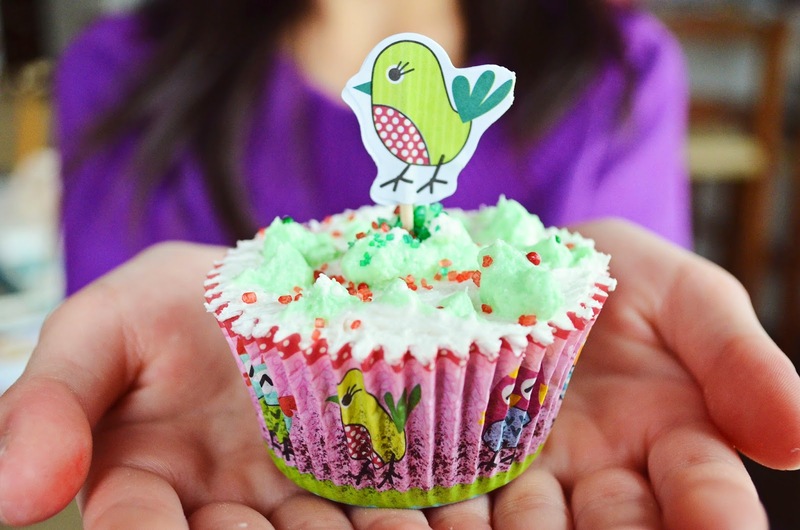 Whether for Easter, a birthday party or just to brighten someone's day, a cupcake says it's time to celebrate. I decided to make these Vegan Mint Chocolate Brownie Cupcakes for the kids (and, let's face it, me) this past weekend. After all, the weekend is something to celebrate, right? I went with a chocolate cupcake base...because you really can't go wrong with chocolate. I threw in some peppermint flavour for a little twist. Of course, cupcakes must be topped with thick, creamy icing. I added a hint of peppermint flavour to the icing as well. 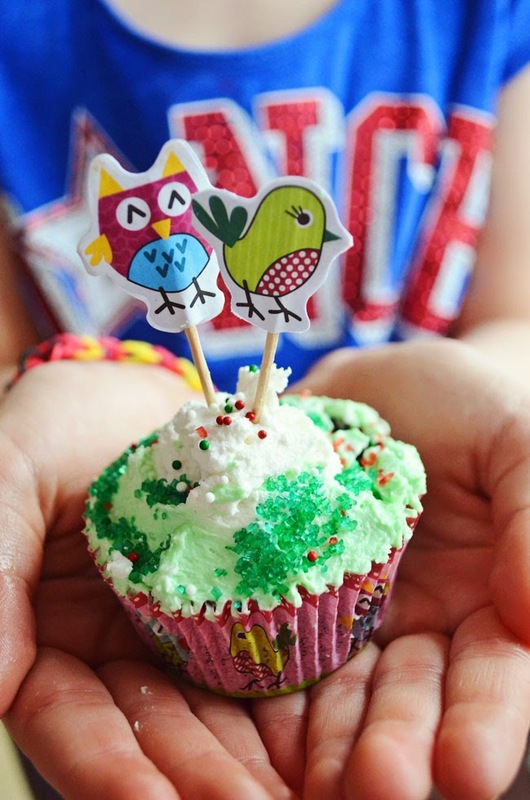 My daughter had a friend over and they had fun decorating their own cupcakes with a mix of white and green icing and some candy sprinkles. I had also purchased bird themed cupcake liners and flags at the dollar store. These cupcakes are more dense than cake and my little gal said they taste like brownies. Hence the name Vegan Mint Chocolate Brownie Cupcakes. 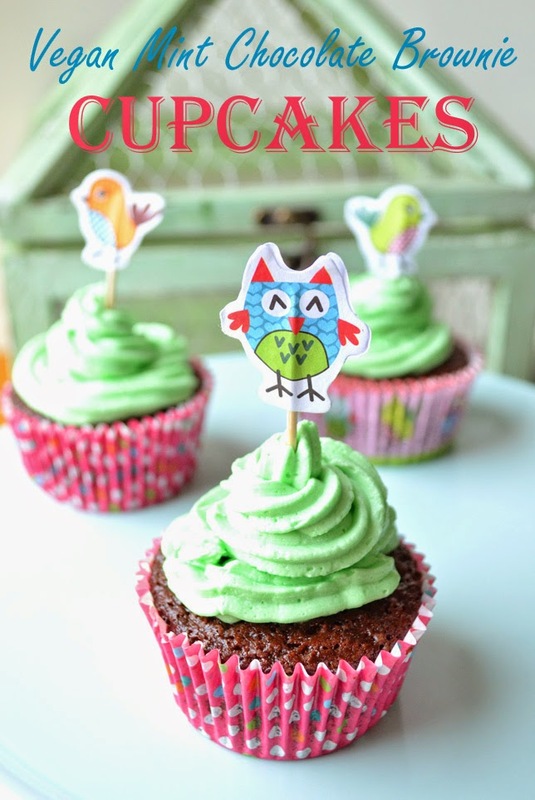 If you are a fan of the chocolate/mint combo, you really must try this cupcake recipe. It's super simple to whip these babies together, icing included. And if you let the kids do their own decorating, your work is even simpler. Preheat oven to 375°F. Line a muffin tray with 12 paper cups. In a large bowl, stir together flour, sugar, cocoa, baking powder and salt. In a medium bowl, stir together milk, oil, vinegar and peppermint flavour. Add wet ingredients to dry and stir until mixed. Stir in chocolate chips. Fill muffin cups halfway. Bake for about 18 minutes, until a knife inserted in the centre comes out clean. Using an electric mixer, beat shortening until smooth. Gradually add icing sugar, milk, vanilla extract and peppermint flavour while mixing. Beat on high for a couple of minutes until fluffy. Love these! They look so good! Beautiful photos too! Happy Easter! Thanks so much Angie! Happy Easter to you and your family too! These sound amazing :) I was surprised to see olive oil in them! Not really an oil I think of for baking..